Every month, millions of workers search for new jobs although they already have one. About one-tenth of these searchers switch employers in the following month. However, most of the job switchers in the United States never reported having looked for a job. This implies that, rather than those workers finding jobs, the jobs actually found them. In conventional models of the labor market, unemployed people search for jobs and respond to job openings posted by employers (as in Mortensen and Pissarides 1994). However, job search is not limited to just those currently without jobs. 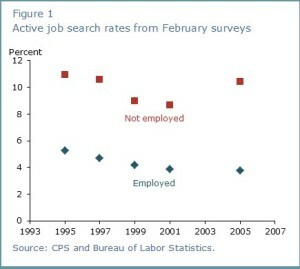 Each month, millions of employed people also search for new jobs hoping to change employers. While a lot is known about the job-search behaviors of the unemployed, the same is not true for the employed. In this Economic Letter, we investigate active job searching among the employed and its implications for labor market turnover. 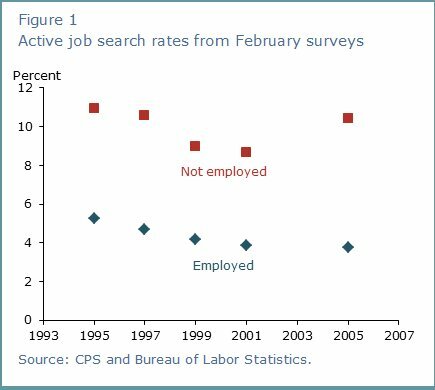 We find that people on a payroll actively search for jobs at about half the rate as those without jobs. Employed workers who search are much more likely to transition into a new job than those who do not. However, roughly three-quarters of job switchers did not report having looked for a new job, because there are many more nonsearchers than there are job-seekers. Instead, workers who switched jobs seem to have been actively sought out and recruited by their new employers.